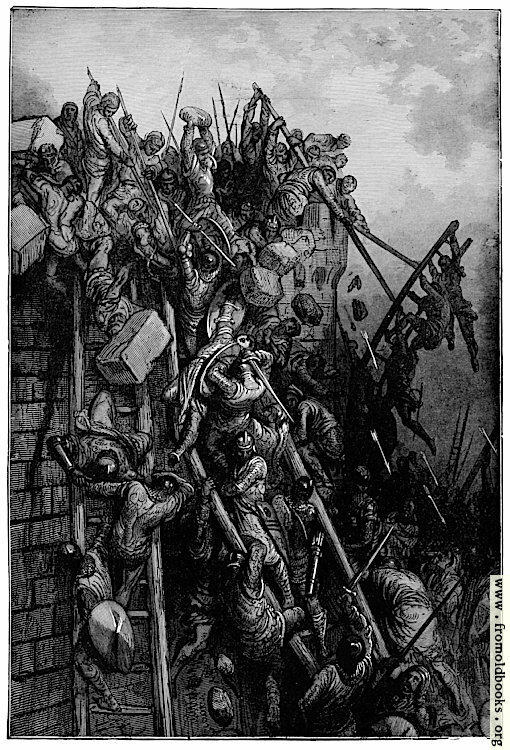 The picture illustrates the siege of Antioch by Christian killers in the first Crusade in 1098. The book in front of me has a story about the towers being emptied by virtue of treachery. It was a preilous piece of business. The traitor was suspected and sent for by Auxian [i.e. Yaghi-Siyan, the Muslim governer of Antioch]. Such, however, was his skill as a dissembler, that he completely reestablished the sultan’s confidence. On the day appointed for the delivery, the Cursaders withdrew as if abandoning the siege. They his themselves in a neighboring valley, and lay there unti nightfall. A storm came on and favored the enterprise. The besiegers returned and swarmed silently around that portion of the rampart which was held by Emipher [modern spelling: Firous]. 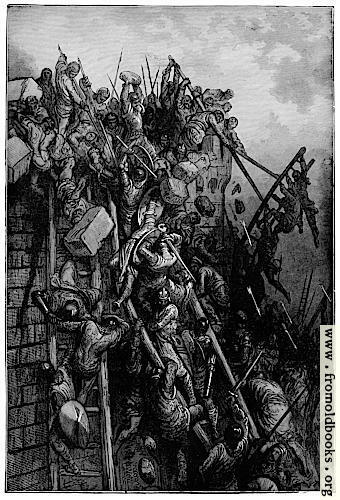 The latter established communication with the Franks below, and the Lombard engineer was taken up to the towers to see that every thing was in readiness for the surrender. 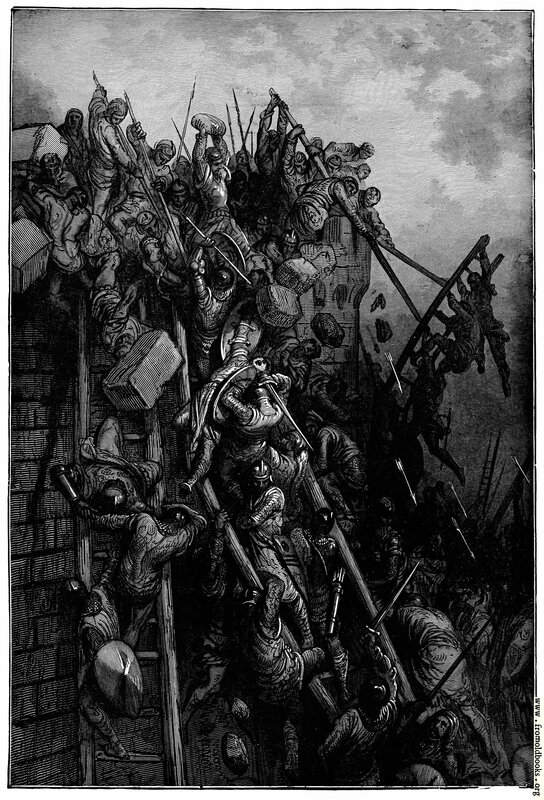 When the signal was at last given for the Crusaders to plant their ladders and ascend, they became apprehensive of a double treachery, and refused to scale the rampart. It was with the utmost difficulty that Bœmund [Bohemond] and a few others, by first climbing the ladders themselves and reporting every thing in readiness, finally induced their followers to ascend. It was found that Emipher was in bloody earnest. There, in the tower, lay the body of his brother, whom he had butchered because he refused to be a participant in the treason. 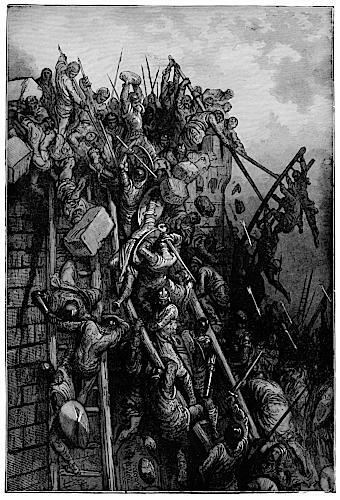 Before long there was another battle and siege, with the Christians now inside; then they broke the siege and won a battle. And so it continues to this day, men killing men, women and children, for no sufficient reason.